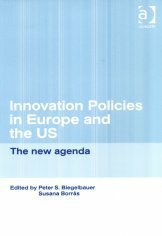 Review: Innovation policies in Europe and the US: the new agenda. In our current knowledge-based economy, the use and sharing of knowledge should lead to sustainable competitive positions for countries in the EU. Especially with the upcoming joining of ten new countries. The momentum of this book, is excellent and describes well how policy makers move from a technological paradigm to a more innovation-focussed paradigm. In this book, the editors provide us with twelve cases of innovation policies in the EU and the USA. Each case is described by a different author, mostly related to universities and governments. In the cases, the authors provide us with an extensive and profound overview of innovations and their relation to economic, political, educational and economic movements. How does the institutional set-up absorb new ideas? What are the forces that enable change? How can we describe the policy learning and diffusion process? How can we view the future of innovation policy in the coming decades? Based on these questions and an analysis of the cases, the authors provide some interesting insights for policy makers to enforce innovation and they rank order the countries based on 'degree and form of change'. Among the countries studied the clearest change has taken place in the Netherlands and Finland, while Austria and the UK seem to be lagging far behind. Although very honoured because I'm Dutch, I have the strong conviction that the Dutch innovation ratio has already decreased strongly. In answer to the second question (What forces enable change? ), the authors describe, for example, the role of the universities as one of the forces that enable change. At this moment, the Netherlands spends only 5% of its GNP on education, putting it in the penultimate position just before Turkey (Nauta & van Steenhoven, 2003: 15). Only 9% of our innovating companies have partnerships with universities (Nauta & van Steenhoven, 2003: 29) leaving us behind Finland, Sweden, Denmark, UK, France and Germany, and in 2001 the EC concluded that the Netherlands (with UK and Germany) is losing momentum. I realize that the contribution of the Netherlands covers the period 1979-1997, so this might explain our quickly declining position. Regarding the future, the editors address four challenges for policy makers: first, the need to foster the enhancement of labour skills; secondly, to foster the ability of firms to be adaptive to a rapidly changing business environment; and thirdly, the availability of risk capital, and last but not least, to place knowledge in a central position. It is very interesting to read the book and see how the editors see overlap and a structure in the innovation policies of the countries covered by the cases. A profound overview of political, technological, educational and economic elements are combined. Several factors for innovation are described, which are clarifying and useful. This book is an essential reading for anyone interested in public policy and policy makers. Some of the cases are inclined to be a little bit biased (for example the Dutch case, putting the Netherlands (in my opinion) in an overestimated position) but the writing is pleasant and taken together the contributions constitute a valuable resource. Nauta, F. and van Steenhoven, J. (2003). Time to choose: knowledge economy 2003. Amsterdam: Knowledge Land Foundation.